Here Anne Street, Head of Humanitarian Policy at CAFOD, tells us more about the Charter4Change. The Charter4Change is an exciting step towards which aims to make a reality the recent World Humanitarian Summit’s aspirations to strengthen the role of national and local organisations in humanitarian preparedness and response work. The Charter is a series of eight commitments – also endorsed by more than 125 national/southern based organisations – which pledges its signatories to change the way they work with and relate to national actors. This includes passing 20% of humanitarian funds directly to national actors, including our partners in project design and decision making, introducing our partners directly to our funders and ensuring that we highlight their work and role in our communications. Interestingly, when the Charter4Change was released in July last year the first commitment – to pass at least 20% of humanitarian funds through directly to national organisations – seemed like a hugely ambitious and indeed ground-breaking step, given that a recent Global Humanitarian Assistance report had calculated that in 2014 a mere 0.2% of humanitarian funds went directly to local and national actors. How much has changed in just a year! 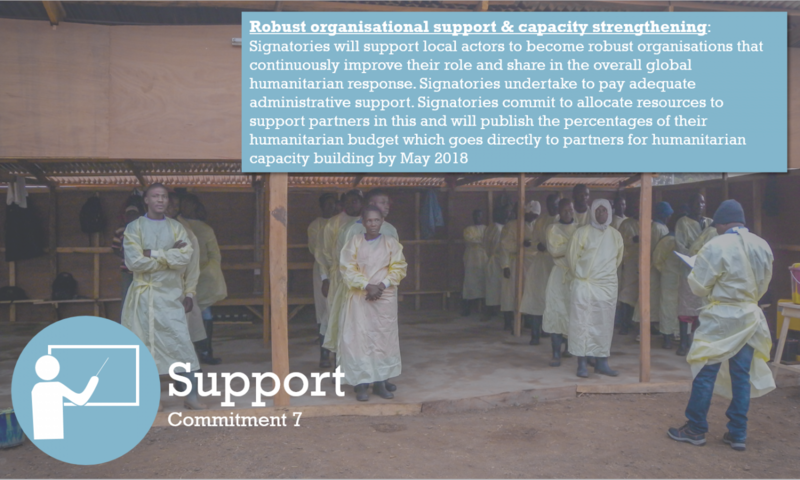 In May at the World Humanitarian Summit signatories to the Grand Bargain went even further and committed themselves to pass 25% to national actors. Clearly the voices of national actors – the majority of the 23,000 people consulted during the World Humanitarian Summit process – have been heard, and international actors are realising they need to adjust their approaches and ways of doing business. Unfortunately, though, this ambitious target in the Grand Bargain is unlikely to be achieved in the same way as the Charter4Change signatories are trying to accomplish it. The Grand Bargain text is watered down by the four little words coming immediately after the commitment to pass 25% to national actors ‘as directly as possible’. This means that the Grand Bargain signatories – including 18 of the largest humanitarian donors, nine United Nations agencies, the three NGO consortia; ICVA (International Council of Voluntary Agencies), InterAction and SCHR (Steering Committee for Humanitarian Response); as well as several individual NGOs – could in fact continue with business as usual. In the case of INGOs this would mean passing money to their nationally registered international affiliate which some INGOs are branding as local or national actors, or continuing sub-contracting relationships with national NGOs and describing that as ‘as directly as possible’. For donors it is a slightly different ball-game as large bi-lateral donors simply do not have the resources to provide grants to hundreds of different national actors, and they will need to continue to rely on a mixture of approaches including pooled funds, and pass-through grants to achieve their own target of 25% of humanitarian spend to national actors. Indeed this is where the Start Network could help donors achieve the 25% by offering them the chance to put money into a new Start Local Fund or a specific window of the Start Fund, which would only be available to national organisations and would be managed and administered entirely by national NGOs. Another option for donors, which is likely to get up and running within the foreseeable future is a pooled fund administered by the new NEAR Network of southern NGOs which was officially launched at the WHS in May. These options would indeed not just be ‘as directly as possible’. They would be directly. But the Charter4Change also recognises that international actors’ relationships with national organisations go beyond purely a focus on money. Indeed one of the Charter’s commitments – which national organisations most wanted to see included, and has perhaps been the biggest stumbling block for some INGOs to sign up – is the commitment to stop undermining local capacity by ‘identifying and implementing fair compensation for local organisations for the loss of skilled staff if and when we contract a local organisation’s staff involved in humanitarian action within 6 months of the start of a humanitarian crisis or during a protracted crisis, for example along the lines of paying a recruitment fee of 10% of the first six months’ salary’. For some big direct implementing NGOs, which recruit locally trained humanitarian staff during emergencies, that commitment makes it difficult for them to sign the Charter. This is a pity as the commitment goes to the heart of how international organisations relate to and support national actors. It clearly isn’t enough to support national organisations with training, organisational strengthening, funds for project implementation and even providing accompaniment, if when an emergency happens and they most need their trained staff, and an INGOs then recruits them. This a highly complex issue, with many ramifications, and is not as simple as just asking INGOs please stop recruiting national NGO staff. So step in Start again! Start Engage’s Transforming Surge Capacity Project (TSCP) has provided a small research grant to four of the Start members engaged in the TSCP project – CAFOD, Islamic Relief, Tearfund and Christian Aid – to research the impact of INGO recruitment of national NGO staff in the Philippines, and to work with national (and international) NGO leaders to propose alternative approaches which meet the needs of both national and international NGOs. This is an important piece of work and another step in the right direction towards implementing the Charter4Change Commitments. We expect to have the results of the research towards the end of this year and can report back in another blog. This blog originally appeared on the START Network website on 11 August, 2016. The original can be seen here.